If you have a used car that is poorly kept road, then do not despair, you just need to buy a good stand. However, this will not be enough. All new struts need to be pumping. If you do not pump the rack, it will have a detrimental effect on piston absorber system. To pump new struts need 2-3 times. Thus, you can identify potential defects in the mechanism. Quite often there is a jamming of the valve mechanism. Please note that the small dips in the resistance mechanism, as well as the exit speed of the stock can not be called a fault. All this has nothing to do with the shock absorber. So, are pumping stand. Turn the shock absorber with its rod down, and then smooth motion and pressure. It is impossible to do it smoothly. The damper shaft in this position you need to lock for about 3 seconds. Keep stock and turn the absorber rod upwards. In this situation you need to fix it for about 5 seconds. After you have withstood the shock absorber in this position for a specified time, you have to gradually push rod until end of turn. Turn the shock absorber with its rod down, and for 2-3 seconds interrupted. Then repeat the above steps 2-3 more times. 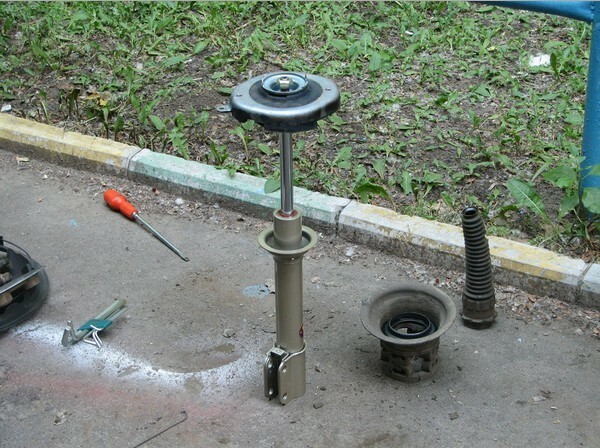 After you have finished pump the shock absorber, must be kept in a vertical position, stem up Next, a control operation. Tap the rod a sharp, but short movements. The piston should move smoothly and without failures. There are shock absorbers in which the fully decompressed condition, the valve mechanism enters into the compensation cavity. It is needed in order to expand the damping liquid when heated. The resistance valve should be no. After you have completed pumping the shock absorber, it is necessary to have in the working position. The stem will be vertically at the top.